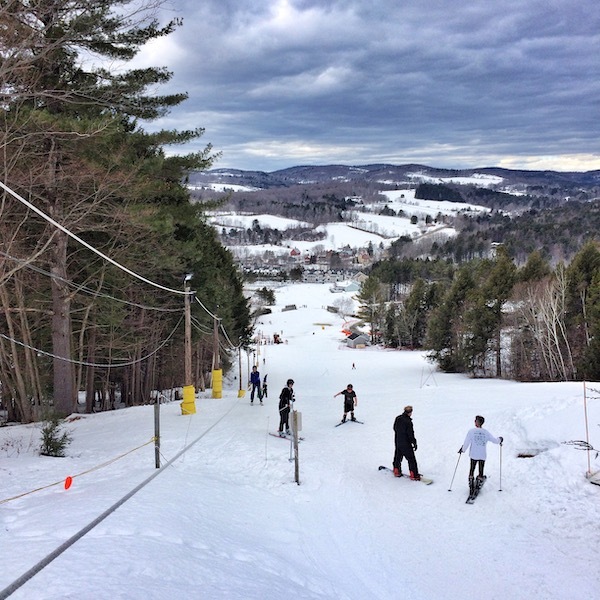 Alpine skiers have been thrilled about Ascutney’s varied terrain and friendly appeal for over 60 years. We have an 800’ Rope Tow that is used for school and community groups, and racing when conditions merit. Following this tradition, Ascutney Outdoors is bringing back lift service with an 1,800’ Doppelmayr T-bar which will serve over ten trails on the lower mountain slopes with skiing for all abilities. We did everything possible to have it operational this season, but all of the rain and mud has made it impossible to complete the job. It will be ready to go next year. The lifts are adjacent to the new Ascutney Outdoors Center, which offers a wonderful gathering place to warm up and relax. Our operations are dependent on volunteers, weather and natural snow conditions, and may be subject to change at any time. We rely on natural snowfall, and our Prinoth Bison snow cat will maintain the best conditions possible. Please check our homepage for the most up to date information. We also aim to keep you updated via Facebook. The Rope Tow is open to the public at no charge, but goodwill donations are much appreciated and support our operations. All skiers must have a lift pass. Check-in and tickets are available at the Ascutney Outdoors Center. No sledding or snow tubing on the ski trails served by the lifts when in operation. All pets must be leashed when in the vicinity of the lift-served slopes. Please read and abide by the Skier Responsibility Code .